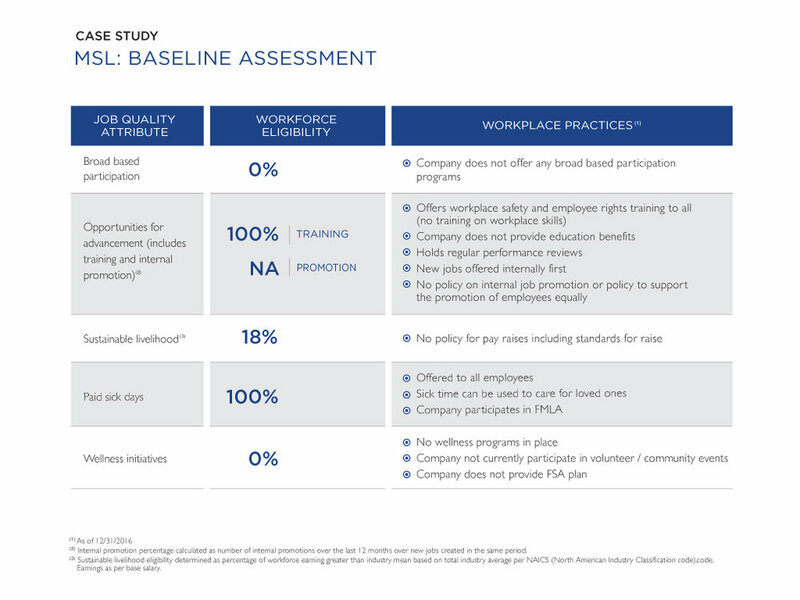 Developed through collaboration with our LPs and industry thought leaders, HCAP Partners’ Gainful Jobs Approach is our operational impact framework for understanding job quality standards at our portfolio companies through (i) a robust quantitative measurement system to assess existing job quality standards and improvements and (ii) active portfolio engagement to identify and implement workplace initiatives aimed at creating and maintaining high quality jobs. HCAP has identified five key attributes of gainful job focused on the themes of economic opportunity and health and wellness. The first step in implementing the Gainful Jobs Approach involves data gathering and assessing current workplace practices in place at the portfolio company. To this end, HCAP developed a Workplace Practices Survey to collect data both at a firm and employee level around the availability of workplace benefits across the five key attributes of a gainful job. This robust data set is then used to create a Baseline Assessment to understand current job quality standards and highlight potential areas of improvement. HCAP then shares the Baseline Assessment with senior management at each portfolio company and uses this analysis as a starting point to develop a customized Strategic Roadmap in collaboration which senior management which includes actionable steps over the next 1-5 years aimed at improving job quality standards. Work with key personnel at each company to furnish data for Workplace Practices Survey which is used to create a Baseline Assessment. Once survey data has been received, it is analyzed to develop a Baseline Assessment for each portfolio company and findings are shared with management teams. Working with company leadership, we aim to develop a Strategic Roadmap to create and implement improvements in job quality standards. 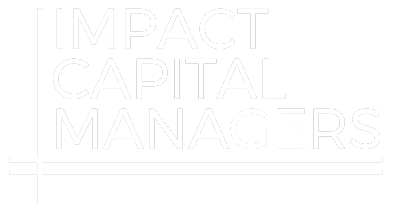 Below are Baseline Assessments and sample Strategic Roadmaps for two of HCAP’s portfolio companies. These highlight the ability of the Gainful Jobs Approach to create a tailored methodology that takes into account both firm and industry specific employment practices..
HCAP has hired an Impact Associate to spearhead the implementation of the Gainful Jobs Approach. 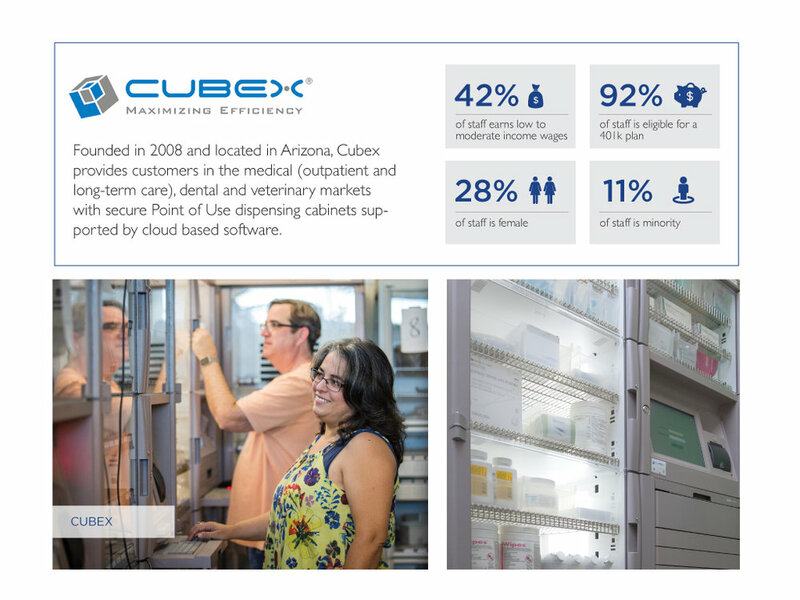 Given our target market range, many of HCAP’s portfolio companies do not have a formalized HR department, as is the case with Cubex. Understanding the bandwidth and time constraints of our portfolio companies, the entire HCAP team works actively with our portfolio companies to implement goals outlined in their strategic roadmaps. 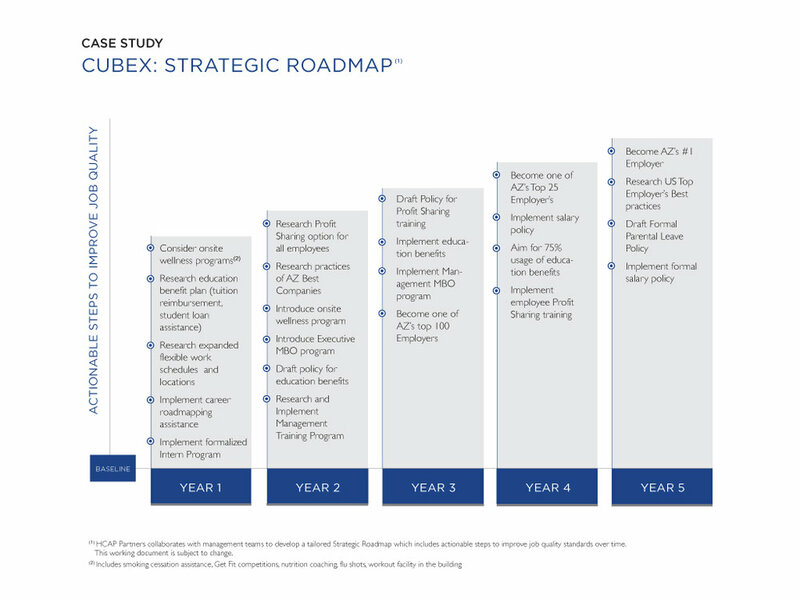 This portfolio engagement includes connecting companies to each other so that they can leverage best practices as well as connections to organizations and benefits providers. Impact metrics measured and reported to LPs include job growth, workforce demographic data by gender and ethnicity, percentage of workforce that reside in an LMI area, percentage of workforce that earn LMI wages and CRA eligibility. Specific to our impact framework, we share Baseline Assessments and Strategic Roadmaps for each portfolio company along with workforce eligibility for each attribute of our Gainful Jobs Approach, which include access to broad based participation plans such as retirement accounts, opportunities for advancement (internal promotion and on the job training), earning a sustainable livelihood, provision of paid sick days and availability of a corporate wellness program.